If you've been reading my blog since it started you may recognise him as he's based on an old & now discontinued design I used to sell in my Etsy shop a few years ago. I keep seeing owls popping up all over the place at the moment so it seemed like a good time to dig out my old pattern! 1. 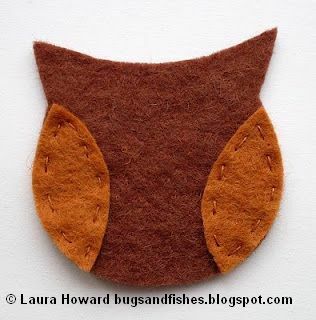 Pin the owl body template to the felt you want to use and cut around it. Repeat this so you have two matching body pieces (a front and a back piece). Then cut out two wing pieces from the other colour you've chosen using the wing template. As the wing pieces are quite small you may find it easier, instead of using a pin, to just hold the template in place as you cut around it. 2. 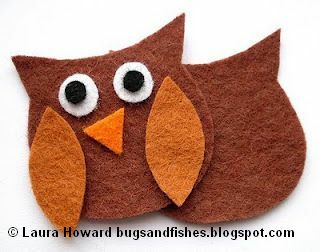 Cut out a small orange triangle to be a beak, and two small white circles & two tiny black circles to be the eyes. If you have difficulty cutting out the small circles try cutting a square slightly bigger than the size you want and then trimming it down to make a circle. You could also use black beads for the pupils. 3. 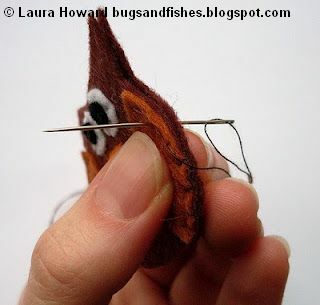 Position the wings on one of the body shapes and sew them in place using matching thread and a simple running stitch. 4. 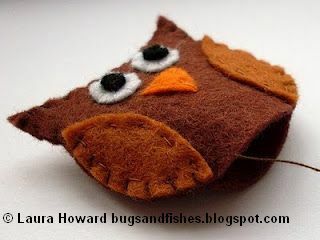 Arrange the owl's beak and eyes until you're happy with their position then sew them in place. I used three orange stitches (one at each point of the triangle) for the beak, a couple of black stitches in the centre of each pupil, and even white stitches around the eyes. 5. Put that to one side, and get the plain "back" body piece. Sew a brooch clasp or safety pin to it using a double thickness of brown thread (I forgot to take a photo of this stage, sorry!). ... then when you've sewn all the way round finish your stitches at the back of the brooch, and you've finished! If you'd like a fat owl instead of a flat owl: when you reach the bottom of the second wing stop stitching and use the opening to stuff your owl with polyester stuffing (use a pencil to poke the stuffing into all the corners). When the owl is as fat as you want it, continue your whip stitches to close up the opening. Here are some fat owls I made earlier! If you print the template at 100% your owl will be the same size as mine. Cutting and sewing some of the small pieces for this design can be a bit fiddly - to make the shapes easier to work with (or if you just fancy making a larger owl!) print the template at a larger size. 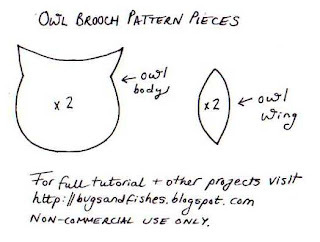 This tutorial is for non commercial use only: you can use it for as many owls as you like for yourself or as gifts for friends but please don't make any for sale. Please feel free to borrow photos if you want to blog about this project, but remember to credit me and link back to the original source, and do not reproduce my entire tutorial on your site. Thanks! Thank you for this tutorial! Can't wait to try it out, I just love working with felt at the moment! I love it when you share, like your little tea bags - I totally made those for Christmas! THanks for sharing another tutorial! Love the owls! Very cute!!! Great tutorial! Thanks for sharing. Yeah, owls are all over the place yet! Very cute owls! Thank you for the tutorial. Thank you for sharing! The owl is cute cute cute! They are so cute! Thanks for sharing your creative ideas. I did give you credit. Will be back to buy some felt soon. So cute! I love it, I'm making one today for my bag. Thanks for the tutorial :) I'm definitely going to link your blog, great stuff! Aww, this is darling! Thanks so much for sharing the pattern. I'll be linking. 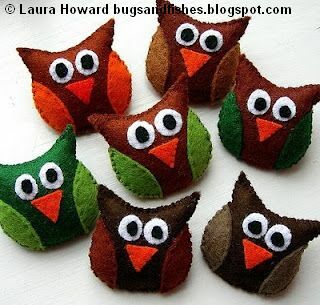 I love these little owls! They are just right for my busy schedule. Thank you for making a project I can do in a flash! These owls are adorable! This will give me a wonderful project to do in no time. Thank you for helping stay creative! Adorable. I can't wait to make one for my little girl. Thank you! So cute!! I found this over on one pretty thing, can't wait to make one!! Thanks for sharing. I love this pattern. This year I am walking in the Breast Cancer 3-Day again and I was wondering if you would let me make these in pink to fundraise. I am going to make some for each person on my team but think it may also be a great fundraiser if it is okay with you. What a cute little owl!! Thanks for sharing! I quite think I could do this. Great tutorial. Thanks for sharing! I've posted a link. These are super cute! Thanks for sharing!!! I love your blog! Thank you very much for the tutorial. 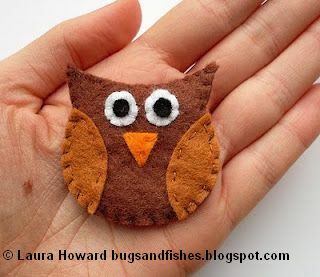 I made a few owls and I put a link on my blog to yours. You have some beautiful work. When I discovered your lovely owl, my 12year old boy immediately wanted me to make 3 of them - one for himself and 2 for his 2 best (girl)friends! Thanks soo much for sharing your design! I loved you blog. I make patchwork but your work in fieltro is fantastic. Some day I will do this tutorial. These are so sweet! I'm including them in my Friday Favorites tomorrow! This is great - thanks. I am attempting to make a felt house to slip over our dining room table for my one year old. It is such fun! This will be perfect for the apple tree I am sewing onto it. Lovely website. Off to look for a felt cat now. These owls are so fabulous as are all your website ideas. Thank you for sharing them, in particular the patterns, as drawing isn't my strongpoint! I have made some of these and the butterflies for a friend who is going on a nursing mission in Haiti, to give to the children she treats. Thanks for such a wonderful website! Thanks for being so inspiring!!! I love these little guys. I made 24 to give as favors for my friend's baby shower. They were a big hit! Thanks for sharing this super-cute pattern. Very creativ and goog taste. So nice your owls. Nice! 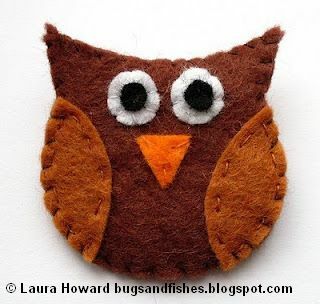 Can the wings and other small parts of the owl be stuck together with felt glue instead of stitching them?Will they stay? I think if you used a glue suitable for sticking felt, that would work. I don't use glue for my own felt crafting so I can't recommend a brand, sorry! What a fab pattern! Thanks so much for sharing it with us - I love these little owls. I've made several to give away as gifts - I embroidered flowers on the wings before attaching them - and my friends just loved them so much they would like to make some themselves. Would you mind if I shared your pattern with them? I'm so excited! 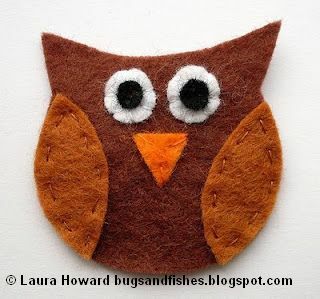 I love owls and can see a whole family of these at my house! :) thanks!